Born on 21st January 1989 in Kuala Lumpur, Aizat Amdan or better known as AIZAT, is the fifth child out of a family of six. After years of determination of getting himself heard, he seriously took the reins of his singing career in 2007, when he decided to produce his singles ‘Sahabat’ and ‘Hanya Kau Yang Mampu’ by Indonesian songwriter Taufik, in the same year which became hits and were in the top 10 of local charts. Due to the friendly success of the singles, his Certified Gold first album ‘Percubaan Pertama’ was released in 2008. Since then, there was no turning back for the new and uplifted Aizat. That first album really enhanced Aizat’s outlook on being more adventurous as a singer-songwriter. 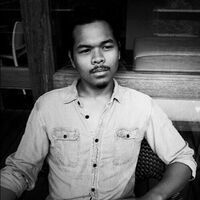 So he took his time crafting his passion by producing and published his second full album in 2010, titled ‘Urusan Aizat Amdan’ together with his brother, Anas Amdan. The album showcased his maturity in sounds and also featured 2 English singles to show his diversity in creative expression. ‘Mana Oh Mana’, ‘Susun Silang Kata’ and ‘Sungai Lui’ was the most well received singles from the album, thus the seeds of more eclectic pieces are now planted by the fans for this talented artist. With music collaborations, TV and movie appearances came after, Aizat is now one of today’s most recognizable young figures in the mainstream music scene. Fully aware of his responsibility in spreading positive values to the masses, Aizat continues to break boundaries by making himself visibly vocal through right platforms out there. A legacy in the making, Aizat is now definitely a voice worth hearing from.